I'll find you... I promise. 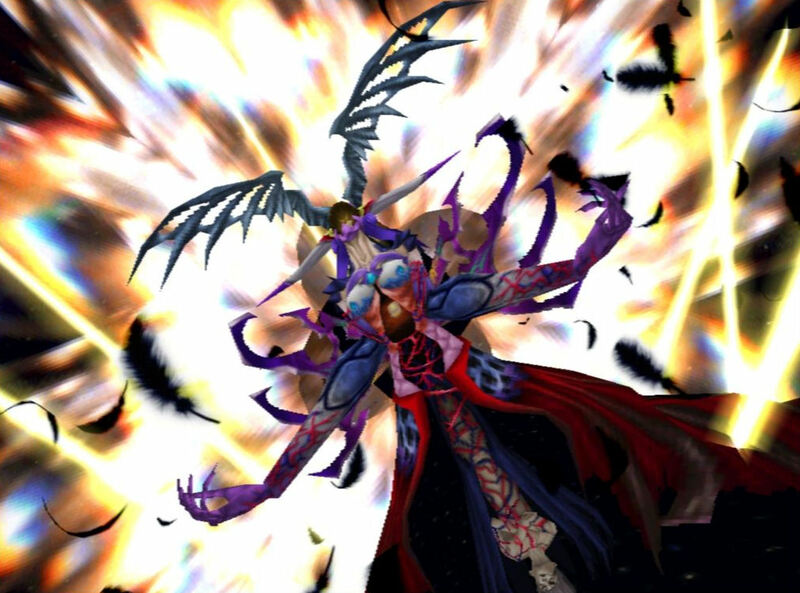 This article contains major spoilers for Final Fantasy VIII. It's filthy with them. Click this button to return home. What on earth is Final Fantasy VIII all about? Some say the notoriously coy eighth entry in the series is about growing up, or fixing the mistakes of the past, or child soldiers. Others contend that it’s about the effects of war on those that live through it, the importance of identity, finding one’s place in a world gone mad. It’s sorceresses, memories, the military-industrial complex, teen angst. All of these interpretations are wrong, and right, and a little in-between. On the surface — and thanks to some uncommonly subtle storytelling for the genre — FFVIII seems to have little tying it together beyond the fact that the main characters are all in the same place at the same time. However, every major player in the storyline is inextricably linked by one shared problem: the inability to achieve one’s goals. No character in Final Fantasy VIII is capable of getting anything important done, and the universe is shaped by that wretched impotency. On eye level with the player, we see Squall struggle with the day to day of life as a teenage soldier boy. He can’t act the way people want him to act, even though he knows it makes him seem like the grumpiest of dead fish. When he’s thrust into a leadership role, the weight of expectations — created, in part, by authority figures that have glimpsed his future path — crushes Squall, leaving him unable to carry on at several points. He needs to be responsible, and heroic, and clever, but can’t shake the feeling that surrendering to fate is losing control of his life. Squall’s romance with Rinoa is defined, in the majority, by Squall’s rude, bumbling failures. He sees a girl, she makes advances, but years of emotional repression and those pesky expectations build walls between the two. The rest of the party is similarly hamstrung by various forces, internal and external. Rinoa herself plays at controlling a grand political resistance force, but manages to achieve little in this regard. People die, wheels turn, as if she had not tried at all. Quistis Trepe, instructor and professional torch carrier, is desperately in love with Squall, but barricades those feelings behind flimsy ideas of professionalism. Even after it becomes clear that he has feelings for Rinoa, Quistis minimises her own sense of agency by dismissing past feelings as misinterpretations of sisterly love. Zell isn’t presented as the most complicated character, but he is nevertheless stopped from even a mundane meeting with a secret admirer by unknown and unstoppable narrative forces. The plan to stop the launching of missiles towards Balamb Garden, a potential high point for Selphie, ends with the school only being saved by an entirely different team. Selphie’s return to a destroyed Trabia Garden feels almost like a penance for her failure, as much as a moment for grief. Irvine Kinneas, master sniper, is left completely unable to shoot when he becomes overwhelmed by feelings of inadequacy. 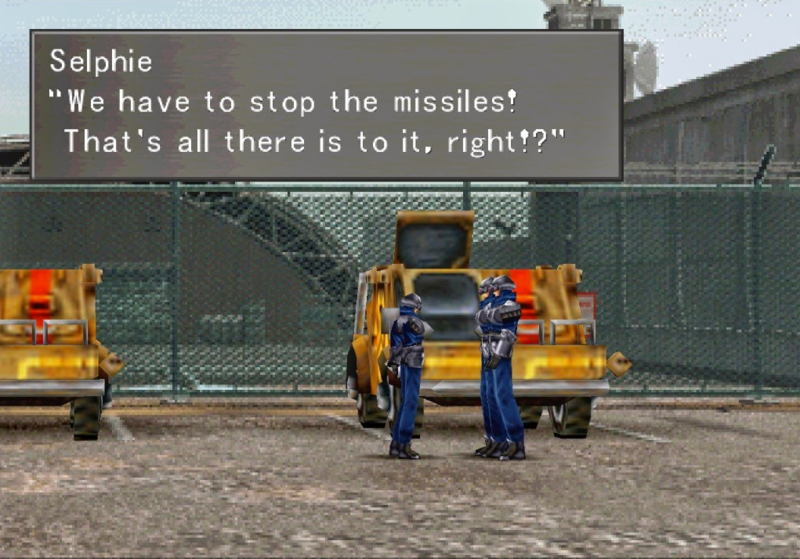 Final Fantasy VIII’s plot is a series of borderline comical failures, culminating in the near destruction of everything that ever was, is, or could be. 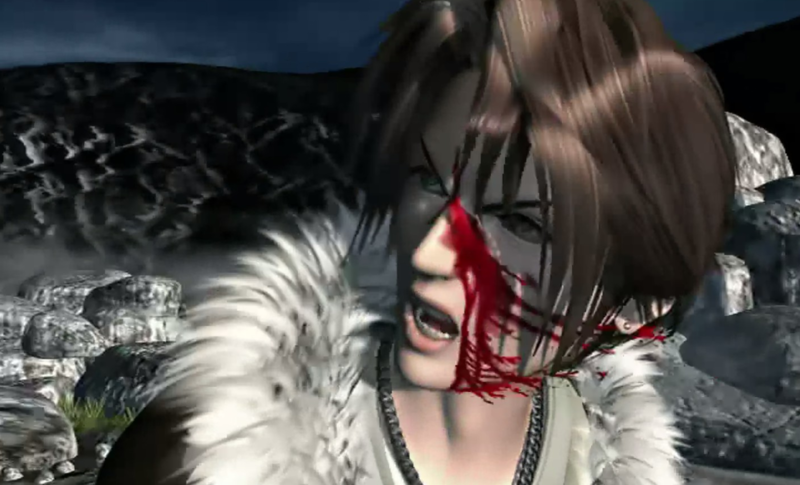 It opens with Squall in the infirmary, having been unable to beat his rival Seifer — a scene which will repeat multiple times before the end of the game. The mercenaries go to defend the town of Dollet, only to have it handed over to the enemy at the end of the mission regardless. In Timber, the newly-promoted SeeDs fail to help the resistance overthrow a corrupt government, before promptly failing to assassinate a sorceress and getting thrown in prison. After a series of mad events, they do a terrible job of stopping a monster apocalypse, don’t prevent a powerful sorceress from being awoken and politely allow an unspeakable evil to compress all of time and space. Very heroic. That’s the point, of course — or it’s one of the dozens of points VIII makes. Heroes don’t exist; they’re not manufactured by the military establishment, or preordained by fate; they’re not even shaped by extreme adversity. There are just people, with embarrassing flaws and awkward circumstances that frequently get in the way of their goals. Even the villains are stuck in literal and figurative loops, trying and failing for an eternity. Sorceress Edea is controlled by a future villain — Ultimecia — for much of the story, unable to stop herself from destabilising the political landscape and threatening the lives of the very children she raised. Beyond her issues with mind control, Edea also fails as a caregiver when she neglects the children at the orphanage and tries to actively mould them — Squall in particular — into soldiers. This blinkered paranoia isn’t even her own, as it stems from the moment when a future Squall drops the dying Ultimecia at her feet. She becomes a slave to the time loop; her agency is revoked. Seifer is a casualty of this as well, treated like second best for his entire childhood because Squall is destined to be the Very Important Orphan. The big, feathery poster child for this initiative-vacuum is Ultimecia herself. A disingenuously straight reading of the game’s narrative paints this future sorceress as the ultimate evil — I mean, it’s right there in her spooky name. Pulling the strings of the past in order to destroy the future, murdering countless innocents and fellow SeeDs, speaking with a strangely harsh accent. But her actual story is crushingly sad and — in typical Final Fantasy VIII fashion — entirely unspoken. Ultimecia hates SeeD (and everyone, really) for hunting her relentlessly, which forms part of her motive for destroying time itself. Since she comes from the future, it follows that she grew up in the wake of events which occur during the game, events which solidify the public’s fear and hatred of sorceresses. After all, who doesn’t remember the time insane magical beings tried to destroy the world? So, little Ultimecia grows up in a world that despises sorceresses, and she’s a sorceress. As a child, she couldn’t possibly understand the reason behind this hate, so she returns it in kind. She amasses power, and eventually begins her plan to compress time. She becomes the architect of her own suffering. At some point this fact no doubt became clear to Ultimecia — if you’re shooting yourself in the foot, eventually you must realise it’s your foot and your gun — but either her rage or the time loop itself prevents her from doing anything about it. She is doomed to bury herself until infinity runs down. Characters strain against this seeming inevitability at every turn, from the vast, world-changing events that push the narrative, to the most microscopic details. Balamb Garden, we are told, serves hot dogs; amazing hot dogs. But they’re always sold out, the player will never get to buy one, and no NPC ever seems to get their hands on one. When the Garden turns out to be a school-sized hovercraft, the characters can’t control it, and are left to somewhat metaphorically drift along until they crash into the next part of the story. The main combat mechanic, the use of Guardian Forces to junction otherwise-inaccessible magic abilities, requires surrendering power to these greater beings. GFs allow the characters to take action, but at the cost of personal agency, and the apparent loss of their individual identities and memories. By forcing the issue and getting things done, they chip away at themselves. Ellone attempts to contact her half-brother, Squall, throughout the game, by sending him back in time into the body of his father, but it only serves to confuse. Laguna himself appears adrift in a sea of untaken roads, as we watch him mess up relationships and generally fail to achieve anything he set out to do. What Squall and his friends are really fighting against, in the end, is being stuck. Time compression shrinks everything down to a single chronal and spatial moment, where everything exists and doesn’t, all at once. It’s meaninglessness, contempt for change and growth. The characters have to acknowledge what has been holding them back, that those barriers are, to varying extents, self-designed, and step beyond. By letting go of their pasts and accepting their personal shortcomings, they’re able to win the day. The penultimate scene in Final Fantasy VIII depicts a celebration. A party at the Garden, filmed on a clunky video camera. Everyone is happy and relieved to be out of danger. But the overall mood of this scene is more akin to a boisterous school dance than something like the medal ceremony that closes Star Wars: A New Hope. Teenagers letting off steam after a tough semester; children allowing themselves to be children, because they’ve learned from the experience, grown up. And, amid the friendly smiles, Zell is eating hot dogs.